Audra got detailed monthly updates, each month. Percentiles measured, progress noted, special stickers purchased to give her something special to mark out every step we took towards one. Ellie gets a hurried couple of blurry photos each month. Lately she's likely to still be wearing a onesie with zucchini bits from dinner stuck to it. Her sister's foot has about a sixty percent chance of being in the frame, because God forbid that looking at Ellie ever causes us, for even the barest second, to stop looking at Audra, too. At least they love each other. Ellie's expression is routinely one of abject adoration whenever Audra speaks to her. A half-smile will become a full beam, and then suddenly my mostly-quiet infant is shrieking happily right back at the older sister who is shouting about things she loves (she will often spend this time declaring how much she loves her Ellie) less than three inches from her younger sister's face. Sometimes, Audra gives her a hug, and Ellie melts into joy. Then Audra piles toys up until I can no longer see my child and we have to go rescue her from Audra's enthusiastic sense of how one plays with babies, which is apparently to gently suffocate them with your affection. 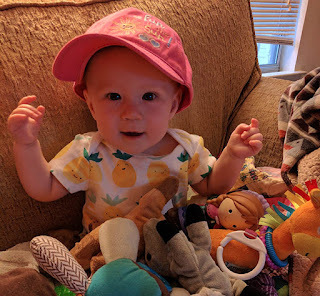 I can tell you that ten months in, Ellie says "uh-oh" and waves hello and goodbye, that she replies to my repeated requests to say "mama" by stubbornly and joyfully shouting "da-da" at the top of her lungs. I cannot tell you when she began to do these things, because they all occurred alongside our chaotic race to keep up with the destruction and havoc wreaked on us by the daughters we adore. I can tell you that she loves discovering new foods but they don't always make it into her mouth, that she has begun purposefully feeding what she doesn't like to the dog when she thinks we aren't paying attention. If she can't see you but she can hear you talking, she will crane herself in every direction trying to look. She and the dog routinely lie down on the floor together, back to back, just quietly soaking up each other's presence. I think he likes that she is quieter than Audra ever was. I can tell you that putting her in the clothes that her sister once wore, that seemed so tiny then, continues to choke me up a little bit as I realize how quickly I am losing this time with my second baby, and how often I am too distracted to realize how much time has already passed. I can also tell you that sometimes waiting out her naptime protests before she finally falls into the sleep she so desperately needs makes every single second drag and drag because all I want to do is whisk her up and away to some new adventure. She likes to sit on the floor to play with her toys, and today she almost started to crawl to reach a toy that was too far away. Then she gave up, sat back, and made angry faces at me, because damn it, toy acquisition and retrival is supposed to be my job. She has fallen head over heels in love with a stuffed owl. For all that she doesn't even move yet, I can barely keep up with her. I don't know how often I'll miss the dates of things or decide that a quick once-over with a wipe will have to replace the leisurely afternoon bath I would have given her older sister at this age. How many times Jason and I will decide that a onesie is a good enough outfit because there simply isn't time to put pants on her. But I can tell you Ellie Rose is ten months old, and her first word is "uh-oh", she's about to crawl, and her red hair is starting to turn blonde. I can tell you she is so loved. I can tell you that sometimes she simply cannot sleep until she has spent a half-hour in the bedroom with one of us, simply rolling around and laughing and soaking up this temporary world in which she is the only child being looked at right now. A couple of years ago (I actually had to go check the news reports, it feels like it JUST happened still in my mind), a woman died in a car accident along my route to work. I was running late that day at a job that was still fairly new to me. I dropped my not-quite-a-year-old daughter off in the baby room with her teachers and got back on the road. I was maybe ten minutes later than usual. I was distracted, driving fast, trying to make up for the time I'd lost. There's a certain spot in my city where you cross a longish concrete bridge and then head immediately downhill, around a slight curve, and that's when you basically "enter" downtown. Just off to the left at the bottom of that hill is a scrapyard, full of cars that have seen better days, many that have sort of become more landscape than vehicle, still sitting in the same spots they were in when we moved to the area five years ago. On that day, I saw flashing lights before I even crested the hill on the bridge and slowed down to see what I can only call a full cavalry of ambulances, fire trucks, and cop cars surrounding an SUV that was fully overturned on top of a couple of those old scrapyard cars. The wrecked car had totally busted the fence on its way in and somehow kept sliding before finally stopping on an old truck. I thought to myself that the upside-down vehicle looked familiar, but not in any way I could put a name or face to. Just that I knew I'd seen that car before. Honestly, in a city that often feels more like a small town, at least on our end, that's not uncommon. "That looks awful," I remember thinking. "God, I hope they got out." I drove on to work. Within a couple of hours, word began to spread — the driver of that SUV had been a woman, with a daughter who attended the same daycare as my own. That's when I realized why I had thought that SUV looked familiar. She and I had similar dropoff and pickup times for our kids. I'd seen her before. I'd seen her child before... she was older than my own, I remembered that much. When they put her photo in the news, I recognized her immediately. We had similar routes and timelines for our mornings. Had I been on time that day, we would have been on the same spot of road at almost exactly the same moment. Here's the weird thing — it seemed like she had swerved to avoid something, had been going fast, and lost control of the car. 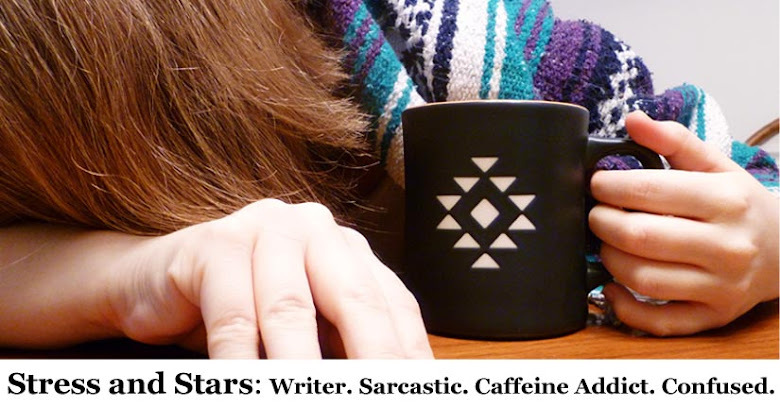 It's a steep downhill slope and it's easy to go fast. We all do. Just part of the morning commute, trying to make up for those lost few minutes we spent trying to talk our stubborn children out the door or stopping to chat or grabbing a coffee on the way. Obviously it could have been an animal, but I thought then — and I think now — that she swerved to avoid a person. That exact spot where her car crossed the center line is one of the worst places in town for people who just run blindly out into traffic to cross the street, steadfastly ignoring the clearly marked crosswalk less than a quarter-mile away. I honestly cannot count the number of times I've had to slam on my brakes or even swerve into another lane to avoid them. I think that person ran off, not wanting to be known as the cause of that accident. I think about how utterly wretched it is to cause a wreck like that and run from it. She did not survive the accident. 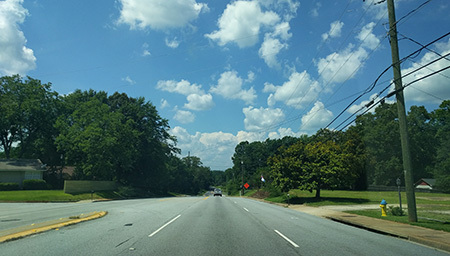 On any other day, I would have been right there, maybe a stoplight back or ahead, but basically in that exact part of the road. I know I've hit my brakes to avoid someone running out into the road at nearly exactly the same time of day as that accident occurred. As it was, dropping Audra off a few minutes late (and spending a few minutes more chatting with her teachers) meant that I only saw a little of the aftermath. Anyway, I tell this story because I think of her every single day. Every time I pass that spot, the salvaged cars in the scrapyard that are still dented from the weight of her car, I think about her. I think about her fiance, and her daughter. I think about who had to pick that little girl up from daycare that day and how they had to try to explain to a very young child what had happened to her mother. I think about them picking up this shattered life and having to build a new one around its absence. I slow down my car going down that hill now. I take it slowly around that curve. I think very deliberately about her. I didn't know her. 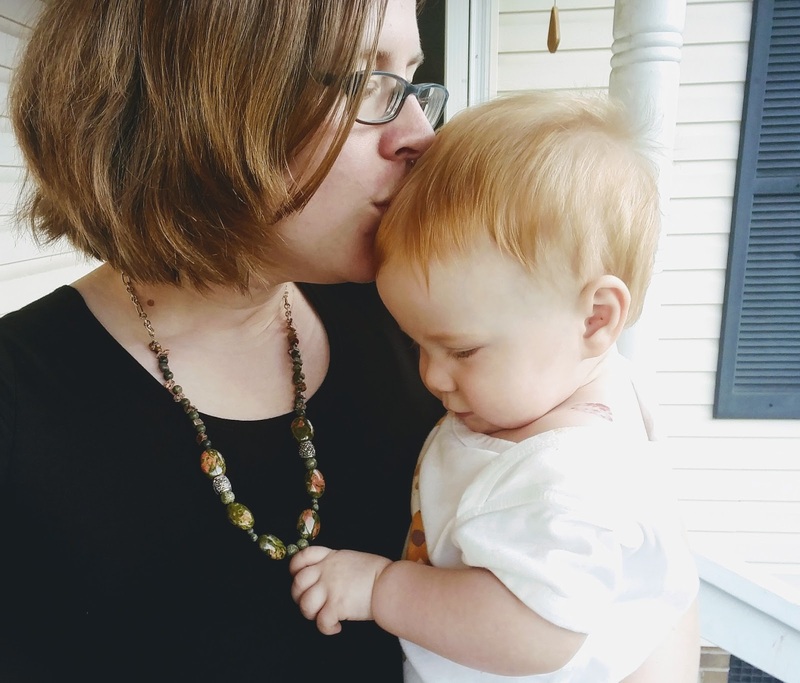 I had never even met her, really, beyond the way you nod at someone in passing when you see them in the parking lot when you're both dropping off your children. Still, she's on my mind every day, as is her family and how they're getting by. I have wondered, before, if knowing that a total stranger thinks about this woman who was everything to them would be appreciated, or simply cause a well-intentioned misery. They've gone through hell at it is. If it doesn't feel like two years to me, it definitely still feels like an open wound to them. Still. Every day for two years I've slowed down driving past that scrapyard. I think about her, say a prayer for her daughter and her loved ones and for her, too. It's funny how people we will never meet can affect our days so profoundly. These days, we often say we are ready for a nap, insist on taking either Mommy or Daddy to nap "in the big bed", and then proceed to shriek laughter, jump up and down, and build forts with pillows until whichever parent is in there gives up and deposits her in her actual bed for actual naptime. Of course, when this happens she proceeds to continue to fight for at least another hour by playing with literally every single toy in her room as she becomes progressively more exhausted, before she gives up and then sleeps way too late in the day and it's a whole big mess. These days, they (mostly) sleep through the night, but when one of them doesn't, neither does the other one. I swear to God they take turns seeing who can make us the craziest. 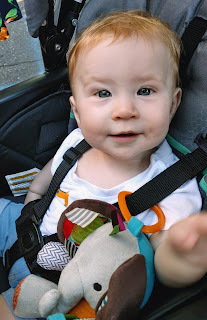 These days, Ellie has (largely) stopped choking on literally every single teensy piece of food you give her, can sometimes wave, and her favorite game is shaking her head "no", pausing to laugh uproariously at her own cleverness, then shaking her head "no" again. She's still in the 25th percentile, my wee little almost-a-preemie. Well... except for her head, which is gigantic. This is apparently a genetic trait my children share. These days, Audra's innate stubbornness manifests in new and unpleasant battles in which she declares war over everything from not wanting to wear that T-shirt today to the cardinal sin I committed by giving her the banana she just asked me for, only it wasn't the right banana. She has yet to gain the ability to discern when a battle is worth fighting. Then again, I haven't really figured that out yet, either. These days, Audra recognizes the letter A and knows it stands "for Audra", the letter M for Mommy, D for Daddy, P and N for Papa and Nana, G for Grandma, E for Ellie, and so on. We haven't quite got them all mastered but we're getting there. She likes to point at signs and say "Look, it's you!" when she sees a letter she knows. She asks me every single day when her birthday party is, and she is never happy with my answer. Although I imagine she'll be happier when I can finally tell her, "In about three hours." These days, Audra loves the old Justice League show that I used to watch on Saturday mornings as a kid. It's her favorite show and Netflix is about to take it away and I am considering starting a petition or simply sending a pleading letter. She loves Hawkgirl and Wonder Woman and superheroes in general and she also wears a lot of frilly pink skirts (except when she absolutely does not want to wear a skirt today — see earlier note about picking battles) and is definitely up for hitting each other with plastic foam swords I found at Target at any given opportunity. 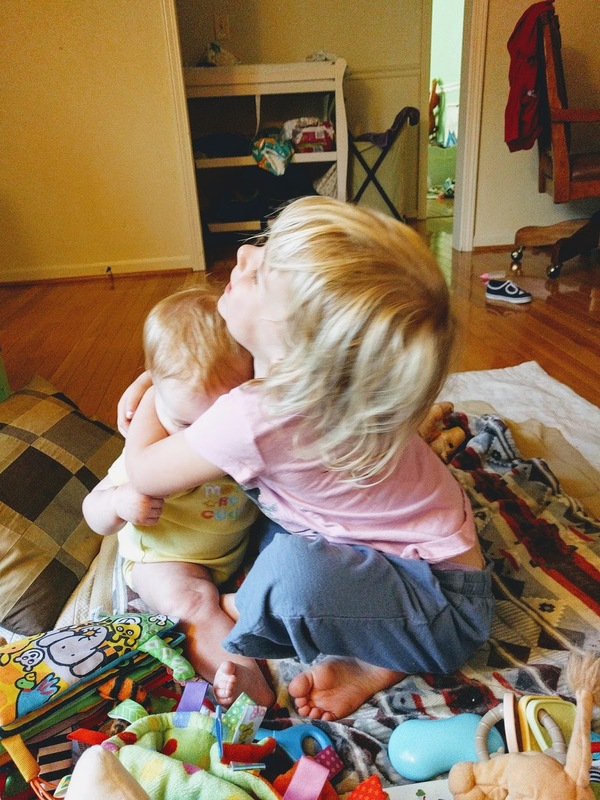 These days, Ellie fulfills every inch the stereotype of the youngest child, largely content to watch her older sister's manic energy as long as an adult is either holding her or sitting nearby. She likes to grab our glasses and is surprisingly obsessed with feeling my teeth. 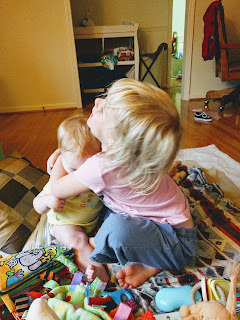 Audra likes to pile things around and on Ellie until it seems like only her little eyes are showing, and we have to step in to uncover her before she literally suffocates from her sister's adoration. These days, I grab my Audra almost every weekend and take one-on-one time at a bookstore where she is content to force me to read every picture book in sight to her and I am content to do just that as long as it means I get to sip my iced coffee. Reading with Audra is... intense. Every single detail must be questioned, picked apart. I must have an answer for every single line that's out of place. She cannot wait for the reading to tell her what is happening, I have to tell her what's happening in the picture and then read the text that usually says the exact same thing. Her favorite book is "the in my heart book", which is good, because it's my favorite book of hers, too. Audra informed me she was "a big kid and grown up now" a couple of days ago, and I jokingly asked, "So I guess you're ready for college then?" 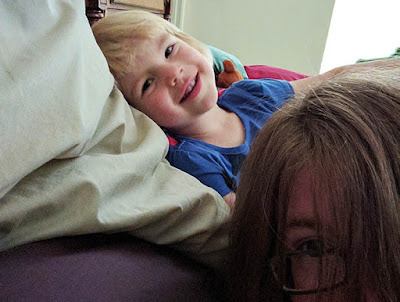 She replied, "Yes, Mom, I am," and I am still trying to figure out when Mama became Mommy became Mom and how she's grown into a lanky nearly-three-year-old while I was distracted by keeping her alive. 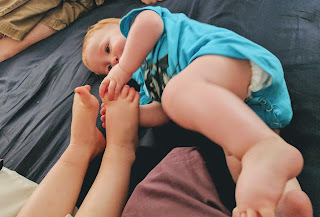 These days contain a lot of long days of small things and we do a lot of just trying to get to bedtime, but I try to remember too that I need moments here or there to just stop and focus on how they're little and they won't be so little ever again. Then I talk wistfully about what if we had another baby and Jason replies with very sensible concerns, like "where would we put that baby" and "how would we pay for it" and "when would we ever, ever sleep" and he's got a point. These days, we're sometimes treading water but we are treading water with our favorite tiny clones of ourselves, so it all works out in the end. I'd still like to get more sleep, though.